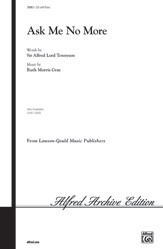 The words of Sir Alfred Lord Tennyson are beautifully set in this lush, contemporary choral for distinguished choirs. Seamless metric changes, rich vocal harmonies, and a graceful piano motif vividly capture the poetic mood. An exquisite work with a haunting melodic theme.